Provide comfort for the family of John Butter with a meaningful gesture of sympathy. BUTTER, John Ross (Jack) Passed away peacefully on March 26, 2019, in his 90th year, to reunite with Wilma (nee McGregor), his beloved wife of 62 years. Cherished father of Glenn (Laurie) and Janet Chalmers (Jeff). Loving grandfather of Danette, Adam (Nichole), Kate (Niall), Lauren (Stephen) and Margaret. Proud great-grandfather of Ava, Jake, John and Kaius. 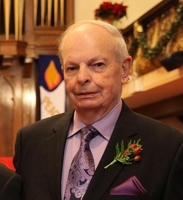 A memorial service will be held on Saturday, April 6th at 11 a.m. at Alberton Presbyterian Church. Interment at a later date. The family wishes to thank Juravinski Hospital for their care and compassion these last few years. If desired, donations to Juravinski Hospital, Alberton Presbyterian Church or the charity of your choice would be appreciated. To send flowers in memory of John Ross Butter, please visit our Heartfelt Sympathies Store. Provide comfort for the family of John Ross Butter by sending flowers.